Rhyolite is a mining ghost town found a few miles west of Beatty, NV in the Bullfrog Hills. Formed by extensive volcanism overlying ancient sedimentary rock, the area's unusual complexity makes for a very colorful collection of rocks that attracted the prospectors' attention in the first decade of the 20th century. Growing to a population of perhaps 5,000 in its heyday around 1907-08, it once boasted electric lights, water mains, telephones, newspapers, a hospital, school, opera house and a stock exchange. Built and financed on over-hyped speculation, the town crashed almost as fast as it was built and by 1920 the population was reduced to near zero. The BLM maintains the site as a tourist attraction where one can examine the remains of the old buildings, a few of which are still intact. There are three open pit mines in the area, the last of which closed around 2000. These appear to be have left the most horrendous scarring to the landscape, carving up whole hillsides and leaving deep pits - such is the power of fully mechanized mining operations. Many of the minor peaks in the area were given names by the miners of old, making for a veritable peakbagging-fest for modest effort. Eight of these are immediately surrounding Rhyolite, the others are not far away but involve some driving for easiest access. None of these can be considered classics, but two of them are found in Walt Wheelock's old Desert Peaks Guide which is what brought me to the area on a cold January day. Ladd is a standalone summit just southeast of Rhyolite, separating the townsite from the Senator Stewart Mine to the east. The huge open pit gold mine has cut precipitously into the east side of Ladd Mtn. A fence surrounds the mine to both keep out trespassers and prevent accidental falls over the manmade cliffs. A steep road leads up from the town to a shoulder on the west side of the mountain where some modest mining had taken place. Class 2 hiking then leads up to the summit. Barbara & Gordon had left a register at the summit in 2008. Though it has very easy access, it sees few visitors - only five pages in the register have been used, the last visitor almost three years earlier by Bob Sumner. The summit offers a birdseye view of the huge mine operation, now silent, and contrasts sharply with the surrounding hills. I dropped north off the summit along the fence boundary, using a series of old roads to connect to the next pair of summits to the northeast. These closely-spaced summits lie NE of Rhyolite, about 1.4mi from Ladd Mtn. Paradise has two easy class 2-3 crags, the northern one being slightly higher. Looking northeast, Burton Mtn lies less than a mile from Paradise and I almost started over to it before realizing an easier access can be made with a little driving. I then turned my attention west to Montgomery, crossing the saddle between it and Paradise, covering the 0.4mi distance in about 20min. Montgomery gets mention in Wheelock's book, but I'm not sure why - it really doesn't stand out from the other summits in the area at all. It overlooks the Montgomery-Shoshone open pit mine to the north, the most productive gold mine in the area, producing 220,000 oz during operations from 1989-2000. The mine efforts cut deeply into the north side of Montgomery, nearly to the summit. I descended to the northeast around the mine fencing to reach the next summits to the north. These two are separated by less than a quarter miles, both located north of the Montgomery-Shoshone Mine. The hike between the two is almost trivial with a high saddle between them. Rainbow gets a mention in Wheelock's guidebook as well, again for reasons unclear. Like Ladd, it sported a Gordon/Lilley register, this one also dating from 2008. A much older scrap of paper dated to 1978 by a Jack Gram of San Diego. 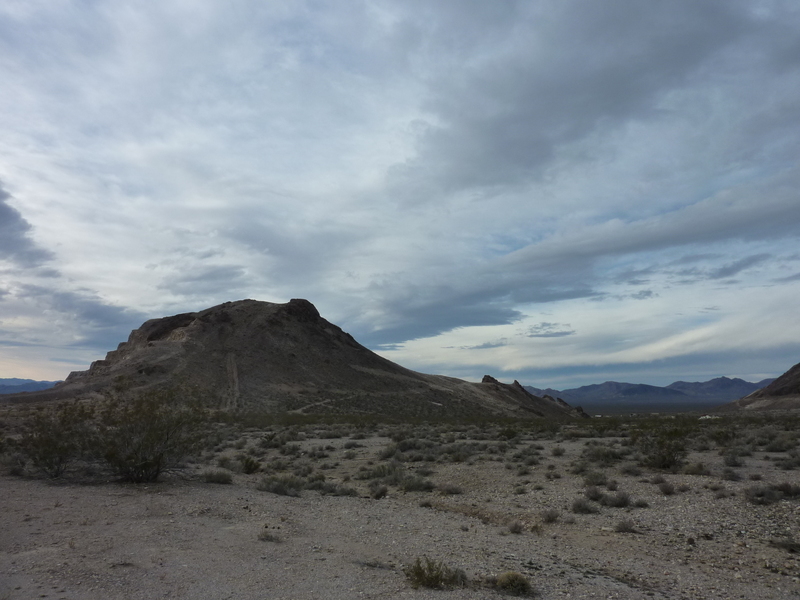 Another 1.4mi to the west lies Busch Peak, the highest summit immediately around Rhyolite. A meandering ridge leading north of the summit eventually climbs another 1,000ft to the highpoint of the Bullfrog Mtns, Sawtooth Mtn. I had climbed this the previous year so didn't pay a return visit, but it would make for an interesting traverse between the two, separated by about two miles of ridge work. From Rainbow Mtn, I dropped nearly down to Rhyolite before hiking back up past Mason Spring to climb Busch from the east. Sutherland is a minor highpoint off Busch's SW Ridge, separated by 3/4mi. The rock along this ridgeline is some of the most colorful in the area with shades of pink, purple, yellow and green, along with the more usual brown, white and gray. Once a short distance off Busch's summit, the ridgeline grows exceedingly easy - one could almost ride a bicycle along here. The last summit I visited immediately around Rhyolite's periphery was Bonanza Mtn, another 3/4mi SE of Sutherland along the same ridgeline. The west side of Bonanza was heavily cut into with the third large mining site, the Denver open pit mine. Like Ladd and Montgomery, a fenceline protects one from accidental falls, or sort of. Coming off Sutherland, I found myself on the wrong side of the fence somehow, without ever crossing it. Luckily my skills were sufficient to keep me out of the giant pit. Now due west of the townsite, I had come nearly full circle around Rhyolite with eight summits. I descended Bonanza to the east and northeast to reach an old mining road that took me shortly back to where I'd parked my car at Rhyolite. It had taken just under 5.5hrs for the nine mile circuit. With 561ft of prominence, Burton was the most prominent of the day's twelve summits (not saying much for the other eleven). I drove back out to SR374 and towards Beatty before turning north on a good dirt road. I took this for 0.6mi into the valley between Paradise and Burton, parking at a junction where the road seemed to deteriorate some. On foot, I followed the fork heading towards Burton, then scrambled up the remaining 600ft, taking less than half an hour. A handful of burros watched me from a saddle on Burton's West Ridge, not exactly running off, but not taking their eyes off me either. At the summit I found another Lilley/MacLeod register from 2008 (a day later than the previous ones), but with no additional entries in the past eight years - a lonely summit, to be sure. I descended the West Ridge off Burton which did not make the burros any happier. They rejoined a few others grazing on the north side of the saddle whereupon the whole unhappy bunch watched me until I had disappeared over the south side of the saddle on my return. The roundtrip time was only 45min.